The sauropod group of dinosaurs included the largest animals that have ever walked the Earth -- up to 40 meters long and weighing as much as 90 tons. Evolutionarily speaking, they were obviously very successful, giving rise to a diverse and widely distributed array of plant-eating species. These forms were characterized by a small head, a long and highly flexible neck that allowed them -- like modern giraffes -- to graze the tops of the tallest trees, and a massive body that made mature specimens invulnerable to predators. 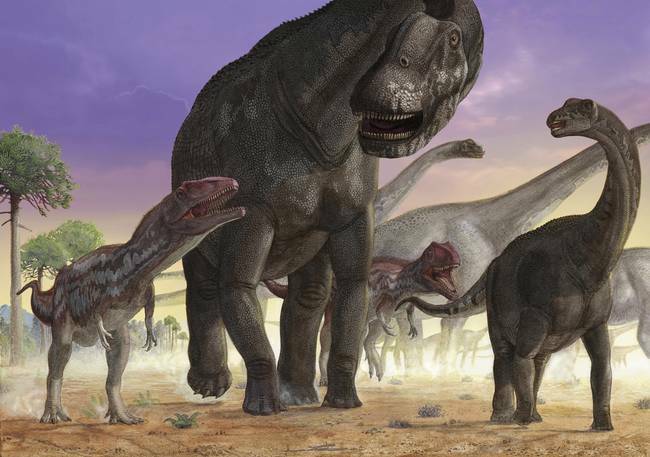 The sauropods survived for well over 100 million years before succumbing to the meteorite that snuffed out the dinosaurs at the end of the Cretaceous Era. However, the early representatives of the lineage that led to these lumbering giants were strikingly different in form and habits. For a start, they were carnivores -- like Saturnalia tupiniquim, an early sauropod dinosaur that was about the same size as a modern wolf. Recent work carried out by researchers for Ludwig-Maxilians-Universitaet (LMU) in Munich in collaboration with colleagues in Brazil now confirms this scenario and adds new details to the story. Most of the evidence for the early members of the Sauropodomorpha comes from their type of dentition. Now paleontologists Mario Bronzati and Oliver Rauhut, who are based at LMU and the Bavarian State Collection for Paleontology and Geology in Munich, have used computer tomography (CT) to analyze fossil skull bones assigned to S. tupiniquim. The high-resolution images of the cranial bones provided by this technique enabled them to deduce the overall surface morphology of the brain. The results suggest that despite being capable of consuming both meat and plants, S. tupiniquim could have followed a purely predatory lifestyle. The new findings appear in Scientific Reports. The evolution of the so-called Sauropodomorpha, of which Saturnalia tupiniquim is an early representative, and the Sauropoda sensu stricto, is marked by a clear tendency towards extension of the neck region, which is accompanied by reduction of the size of the skull -- with a corresponding decrease in the volume of the brain -- relative to the skeleton as a whole. Saturnalia tupiniquim stands at the beginning of this process. But the new study reveals that, unlike the case in the true sauropods, a specific area in the cerebellum, which encompasses the two lobes known as the flocculus and paraflocculus, is particularly prominent in the brain of S. tupiniquim. These structures are known to play an important role in controlling voluntary movements of the head and neck, and are involved in regulating the oculomotor system, which stabilizes the animal's field of view. Bronzati, Rauhut and their co-authors therefore argue that these features enabled S. tupiniquim to adopt a predatory lifestyle. Their findings strongly suggest that, in contrast to the true sauropods, it had a bipedal gait. Moreover, it was nimble enough to hunt, seize and kill its prey -- thanks to its inferred ability to track moving objects with its eyes and to execute rapid movements of its head and neck in a coordinated and precise fashion. With the aid of CT-based reconstruction of the surface anatomy of the brain, the researchers now hope to retrace other stages in the evolution of the sauropodomorphs.